Duplicate files on any device not only occupies precious storage space but affect device speed and performance negatively. These files accumulate on your device over time due to various reasons like file transfer, data backup, file downloading and other reasons. These files generate in various forms like duplicate photo files, audio & music files, documents and other identical files. To get rid of these unnecessary files, you can perform manual cleaning of your device which proves time-consuming and largely inaccurate. Alternatively, you can use duplicate files remover tools for instant and accurate results. One such impressive tool is Duplicate Files Fixer which works extensively to de-duplicate your device instantly and accurately. It scans and removes identical files even from remote corners of your device thus offers complete cleaning of your device. You can use this tool for improved device performance. Select Scan type: - In the first step, to start scanning for duplicate files on your device, you are asked to select scan type on the home page of the app. You can choose any particular folder from audio, videos, pictures and documents options or you can opt for full scan mode. 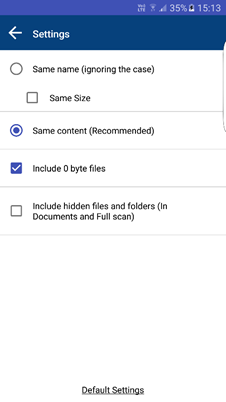 When you select full scan mode, the app will scan your complete device including external SD card (except on 4.4 Android OS version) to find and remove all identical files on it. After selecting the scan type next is to press “Scan now” button to initiate the scanning process. 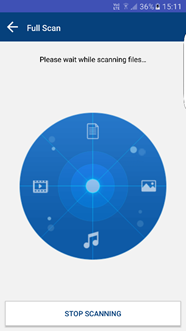 Scan in Process: - When you press “Scan Now” button, the app will promptly begin the scanning process. In the process, it will look for all similar and identical files on your device in selected folder or full scan mode. The scanning process time may vary according to the data app needs to scan. Though the process is instant and offers accurate results. Once scanning is started, you can stop it in mid, if you want for some reasons. To do this, you need to press “Stop Scanning” button. The app will initiate a whole new scan process next time. Scan Results: - Once the scanning process is complete, the app will display results in groups in auto-mark format. In auto-mark format, all last file (s) of the groups remain marked to be deleted. 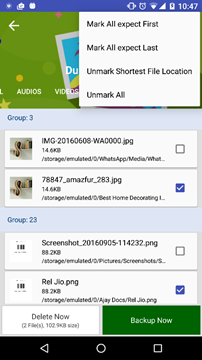 Thus the first file of the groups will stay on your device as primary storage file. Another option called “Mark All except last” allow you to mark all first files of the groups to be removed. Use “Unmark All” option to unmark all files and manually select them for deletion. Once marked and selected next is to delete this identical data. To do this, press “Delete Now” button to remove all unnecessary data and recover some precious device storage space instantly. Alternatively, you can use another impressive feature to backup all your data on cloud servers. It uses cloud backup tool called “Right Backup” to take backup of your sensitive data. To take online backup of your data, you can select the files from the folders (pictures, music, videos, documents & contacts) or you can choose “Custom Selection” option. This feature will allow you to select files from your device storage and SD card to take backup. Unmark Shortest File Location: - This is one useful feature of the app which allows you to access your files instantly. Using this feature, you can unmark those identical files which exist at the shortest file location on your device. At the same time, it will mark and delete those files which exist at the longest file location. One can find this option from the menu (three vertical dots at the upper right corner). Ignore list: - You can use this attractive feature to add those files in the Ignore list which you want to exclude from the scanning and deletion process. You can avail this feature by pressing ADD button to add files to the Ignore list. To remove files from Ignore List, just press the Remove button. This useful function helps you retain your personal and valuable data untouched on your device. 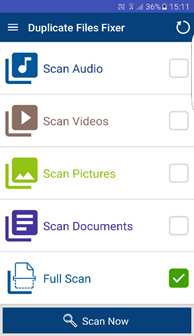 Scan Filters: - Scan filters option available in the Settings of the app helps you to set parameters to scan for all identical or similar files on your device. It offers many filters like same name, same size, and same content. You can even add 0-byte files and include hidden files and folders in documents and full scan mode. Using this feature, you can improve your scanning process. Alternatively, you can set default settings by pressing “Default Settings” option. Language: - App is useful to perform numerous tasks in several languages. It helps users around the world with different language choices. It offers users all the main language choices. You can click on the language of your choice from a list of options, and the app will translate aggregate functions in your selected language instantly. It is useful to understand and perform various tasks on this app quickly. Themes: - App offers two distinct themes to cater taste of various users. It offers classic and material themes with intuitive user interface and helpful features. Both the themes are user-friendly and features packed to perform all tasks. 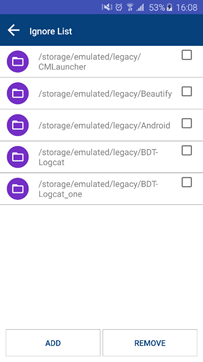 This impressive app uses advanced algorithms to find and remove all identical files from your Android device instantly. Its advanced algorithms scan and find identical files on whole your device in an accurate manner. It helps you manage your device storage space in much organized and better way. 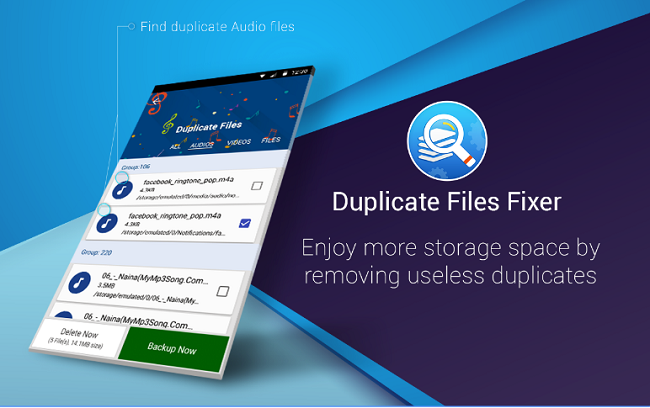 This app offers all latest features to fix your duplicate files worries and helps you de-duplicate your device instantly. This useful app is highly recommended for the users around the world for instant and accurate results.